All-Clear Issued After Fire Breaks Out in Contra Costa Co. The public is allowed to resume normal activities after a fire in Contra Costa County prompted health concerns. Bob Redell reports. The Contra Costa Fire Department battled a two-alarm brush fire Wednesday afternoon in the 2700 block of Pittsburg-Antioch Highway that left three injured, including a firefighter. 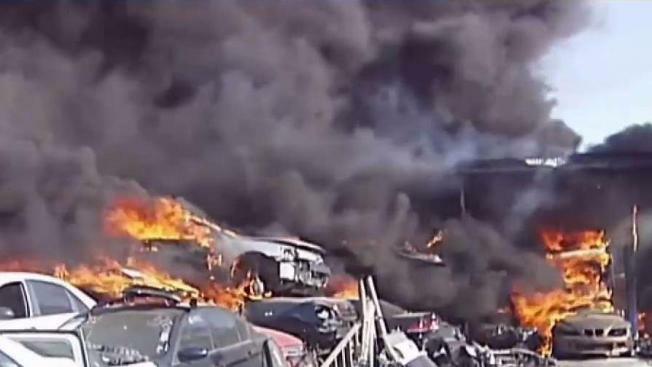 The fire began as a vegetation fire around 5:30 p.m. but quickly burned into a junkyard, producing black plumes of smoke. Two civilians sustained unknown injuries while the one firefighter suffered from burns to his hands. The blaze was caused by a burning candle at a homeless encampment, officials said. Firefighters had trouble containing the flames due to high winds but managed to put it out around 7:30 p.m. Though the flames were contained, the amount of smoke in the area caused concern, prompting the Contra Costa County Health Services and the county's Fire Protection District to send a warning to those nearby. "Eye, skin, nose or throat irritation may be possible for some people in the affected area," they wrote in a statement. "If people experience any irritation, advise them to go inside and rinse any irritated area of their body with water." Officials later issued an all-clear message, stating that nearby residents could resume regular activities.